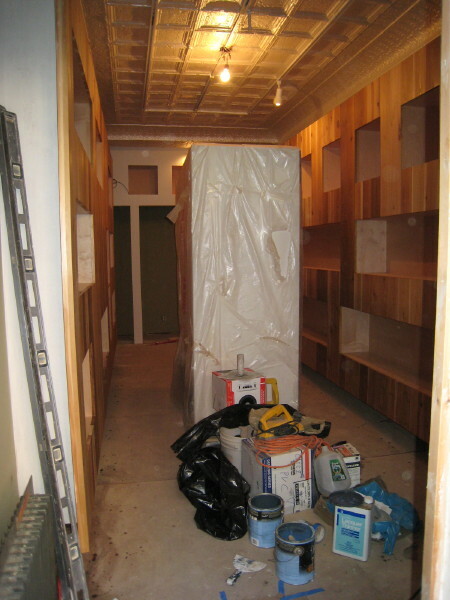 As of this morning, this is the look of the space as the display shelves near completion. 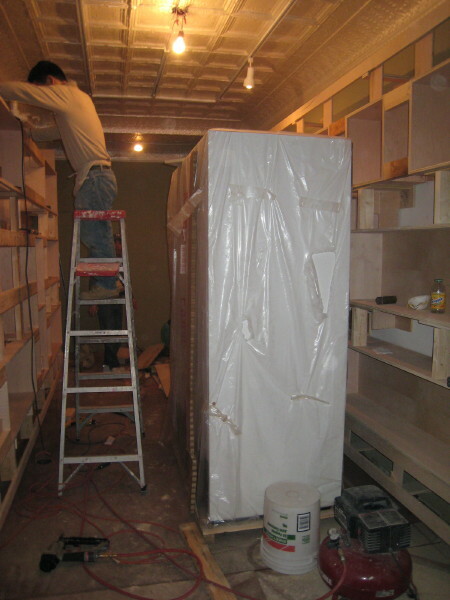 The white “monolith” in the center of the room is the cooler which will ultimately be centered at the back of the shop. Friends take heart, Sakaya is slowly emerging! 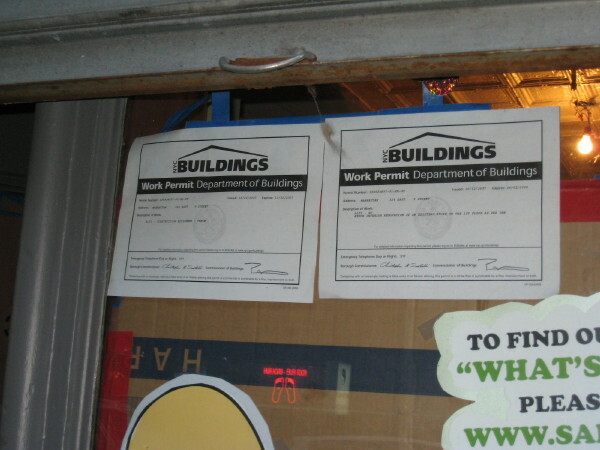 Yesterday afternoon when we stopped by to check on the store, we encountered a veritable beehive of activity behind the building permits prominently displayed in the window. 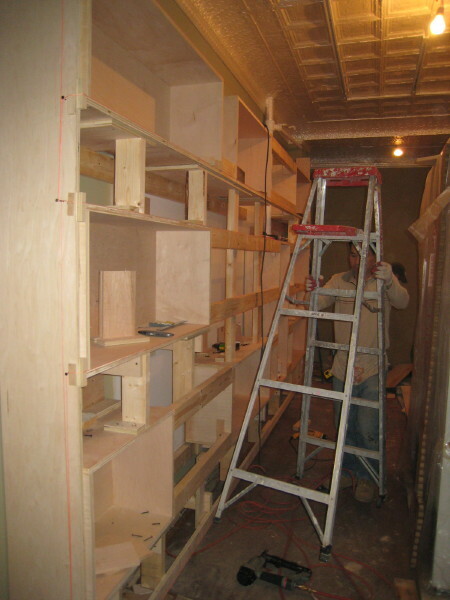 Upstairs, workers were busily fabricating the skeletal structure for the shelves. 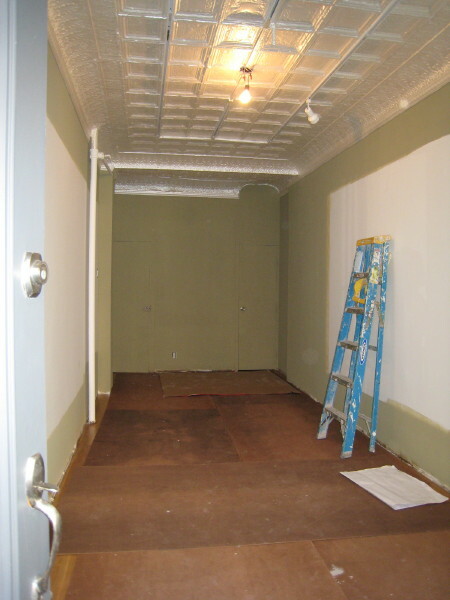 And downstairs, a team was engaged in putting the finishing touches on the newly erected sheetrock walls. According to our neighbors, these efforts are continuing “’round the clock” which of course, gives us hope that they will complete construction in the next week to ten days. Yes, Sakaya is actually beginning to take shape! To this, we joyfully say…. On Wednesday morning we were excited to open the New York Times Dining section and find a feature story on Hiro and Swee our design and construction dream team (link provided at the end of this post). It has been a true pleasure getting to know them and we couldn’t be happier that they’ve garnered this recognition for their work. When we first met them last March we were impressed by their humility, candor, and interest in understanding what our vision was. Although they tend to work on smaller scale restaurants, our store was small even by their standards but they believed in Sakaya and made us their first retail project. Their creativity and craftsmanship was the perfect match for what we envisioned as the personality of our store. We hope that when you visit us that you’ll feel welcome and appreciated by not only the staff, but also by the environment that Hiro and Swee have created. With over 1,700 years of history, sake is older than the Japanese written language. Lore has it that natural airborne yeast landed on an open container of rice producing a slightly fermented liquid that gave some lucky farmers a pleasant buzz. 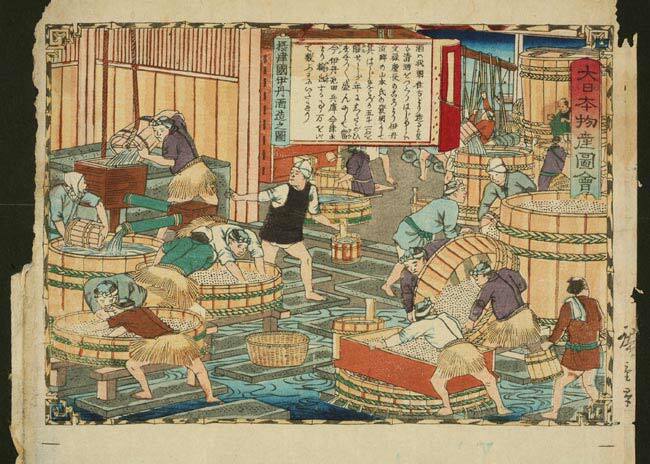 A more factual history documents sake as having migrated with the first Chinese immigrants to arrive in Japan. In any case, by the year 700 or so, it had gained favor with the Japanese Imperial Court which formed its own brewing department. As Buddhism took root in Japan, sake took on a religious ceremonial role bringing sake-making directly into the hands of the shrines and temples. It was during this period that sake brewing methods and “technology” made major advances creating the beverage that resembles what we know today. 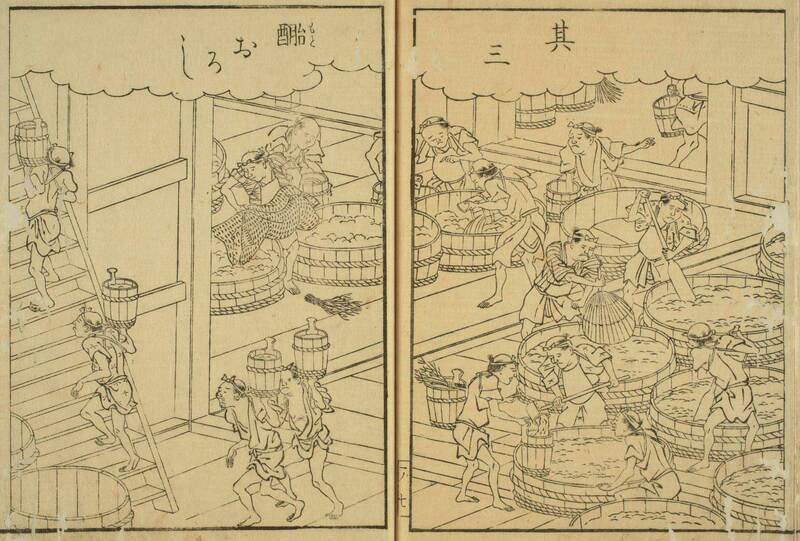 Within another 400 years or so, breweries had cropped up all over the region surrounding the ancient capitals of Nara and Kyoto and pasteurization was discovered (about 300 years before Louis Pasteur was born!) as a means of prolonging the life of the product. From its ceremonial start, sake went on to become a staple of daily life for common folk and an integral part of the national culture. 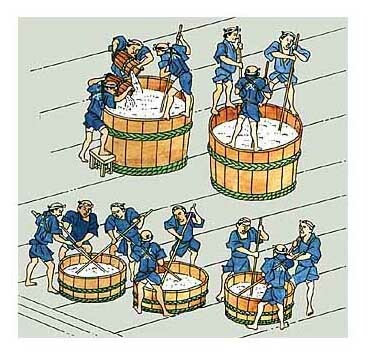 Following WW II, the end of rice rationing and brewing innovations produced great strides in sake diversity and quality with Japanese national consumption peaking in 1974. Unfortunately, the volume and number of breweries have been in decline ever since. 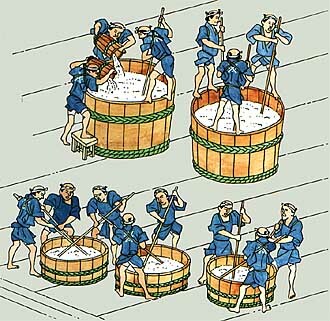 Today, there are roughly 1,100 active sake breweries (sakagura or kura) spread throughout all but one of Japan’s 48 prefectures. Sounds like quite a few right? Well, in 1923 there were about 10,000! And as recently as 1970 and 1988, there were 3,500 and 2,500 respectively. While the number of breweries and overall sake production has fallen, the good news is that premium or ginjo-shu sake production has actually increased. Even better news is that we in the U.S. are a prime market that has captured the attention of Japan’s sake industry. The interest in sake in our country has grown rapidly as evidenced by the year-over-year double digit increases in import volume over the last several years. Our country has only begun to discover the pleasures that centuries of Japanese brewing craftsmanship has created and refined to one of the most intriguingly complex, food friendly beverages on the planet. And that dear friends is why Sakaya will be there for you! October 1st is Sake Day or Nihonshu no Hi in Japanese. Sake Day officially originated in 1978 when the Japan Sake Brewers Association declared it as the day to celebrate and promote the enjoyment of sake. Historically, its origin can also be traced to the implementation of the Japanese State Taxation Law in 1895 which taxed sake based on a production calendar beginning in October. In addition to the practical (tax) and rice harvest rationale for this timing, there is also the idea that it has some basis in the fact that the kanji or Chinese character for sake is 酒, which is very similar to that of the Rooster, the tenth sign of the Chinese zodiac 酉. 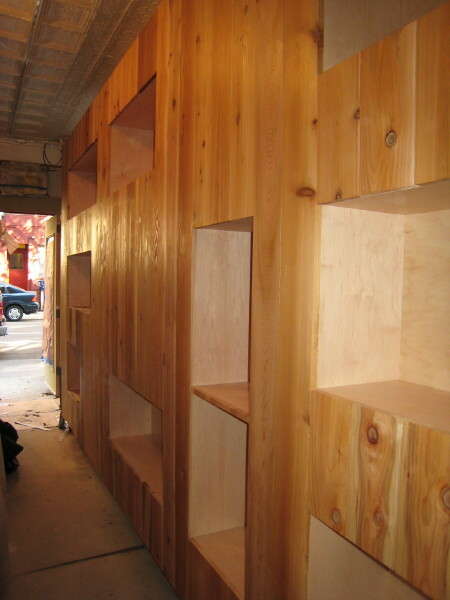 On this particular Sake Day, we are also celebrating the progress on the interior of our shop. The personality of Sakaya is beginning to take shape with freshly painted “river rock” colored walls, a “metallic pearlescent” white ceiling, and a stripped and refinished cedar-shade floor. Please join us in enjoying a cup, glass, or bottle of sake today to thank our friends in the sake brewing community for their dedication to creating and producing this exquisite beverage. You are currently browsing the Sakaya NYC Blog weblog archives for October, 2007.